Set in the heart of Orange County, The Vintage Rose has themed itself on a swanky Paris boutique, overflowing with retro props and eclectic features. 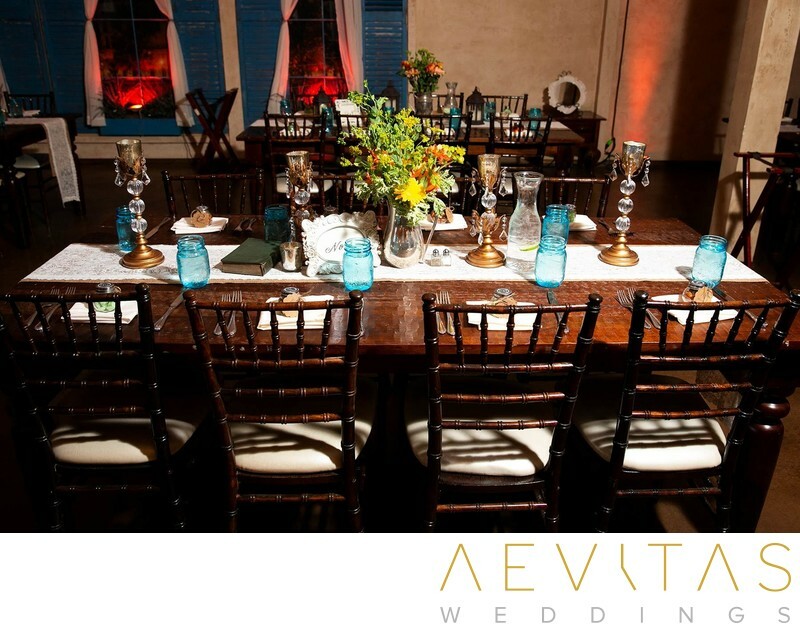 It provides an intimate space for small wedding gatherings, with plenty of talking points as your guests mingle around its charming mismatched furnishings and artistic features. Entering The Vintage Rose is like stepping into a European village, with distressed wooden shutters painted a vibrant blue and rustic fireplaces exuding a cosy atmosphere. There is a relaxed lounge with couches and chairs where your guests can enjoy cocktail hour whilst taking in the decorative features that surround. Its centerpiece is the Paris Ballroom, with its Eiffel Tower and moonlit River Seine backdrop, set beneath elegant chandeliers. Whether you choose to hold solely your reception here, or your ceremony as well, this is a wedding venue that never fails to inspire, from its captivating decor down to its foodie-approved menus. The owner of The Vintage Rose (a confessed wedding-lover) strives to create a highly personal relationship with all their wedding couples and create a day that is infused with love, romance and whimsical charm. The Vintage Rose offers a range of different wedding day packages, inclusive of venue charges, all catering, bar services, staff and decor. The result is an affordable event, without hidden extras, and stress-free planning ensured by their warm and experienced wedding coordinators. Whether you hold Paris in your heart or want to style a 50s themed wedding event, The Vintage Rose offers an enchanting backdrop for your wedding photos that will linger long in your guests’ memories.